Getting kids excited about reading has been shown to enhance their imagination, communication skills and future academic success. That’s why for our latest philanthropy event, Wodify’s North American office participated in Read Across America at H.B. Wilson Family School in Camden, New Jersey. Read Across America — the country’s largest reading awareness event — is held annually on Dr. Seuss’s birthday, March 2. Thousands of schools participate every year to promote reading, writing and literacy skills with activities commemorating his work, and our team was eager to get involved any way we could. 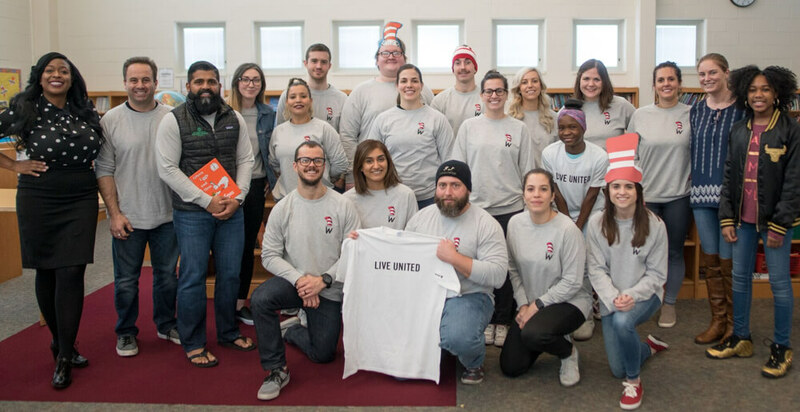 To plan Read Across America, Wodify partnered with United Way of Greater Philadelphia and Southern New Jersey — a non-profit organization whose mission is to fight the cycle of poverty through a focus on early learning, career development and economic self-sufficiency. Darwisa Strabuk, engagement manager for United Way, said it was a pleasure to work with Wodify and that students were thrilled to participate in Read Across America. When we arrived at H.B. Wilson, we divided ourselves into groups of two or three and read Green Eggs and Ham to 10 pre-k, kindergarten and first grade classrooms. Many of the kids knew the book by heart and were full of energy throughout the story. Their enthusiasm was infectious! By the time we’d finished reading, everyone had a smile on their face. After storytime, we played a game called “Pin the Egg on the Ham,” gave out prizes and colored. We also donated 150copies of Green Eggs and Ham — one for nearly every child we worked with. Overall, Read Across America was a fun, rewarding way for Wodify to make an impact in the community. As a company, Wodify is committed to giving back to the community. That’s why every quarter, we give one percent of our time volunteering, one percent of our services and one percent of our profit to local charities and volunteer initiatives. We love getting involved, so if there’s a project you need help with, feel free to give us a shout!